It is time to take action against the notorious oystershell scale, because the eggs are now hatching into young crawlers that are extremely susceptible to insecticide applications. However, as the scales mature later in the season, they are more difficult to control because they form an impenetrable protective covering. Oystershell scale has a wide host range, including ash, birch, dogwood, elm, hemlock, maple, poplar, privet, walnut, and willow. 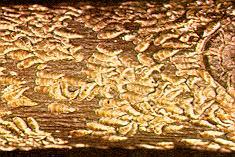 Eggs hatch into young, creamy white to brown crawlers that are active from May through June. The crawlers locate a place to settle and then use their piercing–sucking mouthparts to remove plant fluids, which causes leaf yellowing, plant stunting, and possibly death. Branches or twigs totally encrusted with oystershell scale eventually die. Insecticides recommended for managing oystershell scale include acephate (Orthene), bifenthrin, carbaryl (Sevin), malathion, insecticidal soap, and horticultural (summer) oil. All these insecticides should be applied when the crawlers are most active, which increases their overall effectiveness in controlling oystershell scale populations. Repeat applications may be needed 10 to 12 days later, as the eggs don't all hatch at the same time. Lilacs and maples should also have a repeat spray in early August.